Basically, HOPT is used for lifting Pallets (Wooden, Steel & Plastic). Fork goes within the under clearance provided in the pallet. HOPT gets raised to 205 mm from ground by the pumping action of the handle. This lifts the Pallet from the ground. Now you can take the pallet anywhere you want. 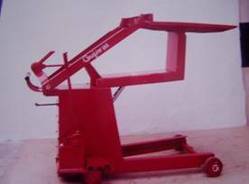 The hydraulic Stackers are normally available for a capacity of 500 and 1000 kg capacity. The Electro Hydraulic counterpart is available in 500, 1000, 1500 kg capacity. When the Jack is attached to the Skid, it becomes a trolley on 4 wheels.